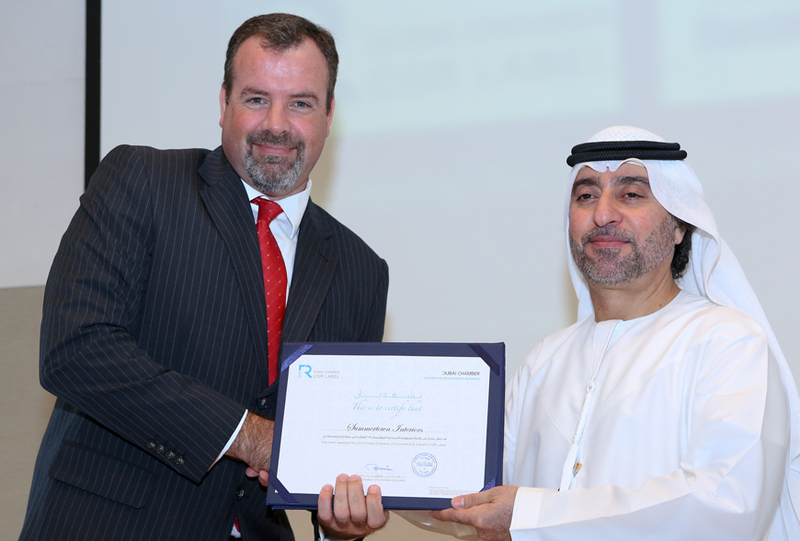 Summertown Interiors has received the Dubai Chamber of Commerce CSR label for the third year running. The award was presented at a ceremony on 25th September to Summertown’s Projects Director, Paul Briers. The program was introduced by the Dubai Chamber of Commerce in 2011 as a diagnostic tool for companies to be able to assess their current approach to sustainability and following review, identify new goals that will enable companies to improve. Participants include many of the UAE’s leading corporations such as Majid Al Futtaim, Chalhoub Group, and UAE Exchange aswell as many international firms such as Standard Chartered Bank, Unilever and TNT. “Summertown Interiors is honored to receive this award alongside major local and international companies. We are proud as an SME to be recognized for our efforts to integrate CSR into our business alongside world class leaders in the field of sustainability. This great initiative from the Dubai Chamber of Commerce is helping companies like us develop our strategy, policies and management practices through the framework, enabling us to set realistic goals allowing for further improvement” says Briers. Summertown was praised for its initiatives such as its Employee Wellness Program, Employee Volunteering Scheme and improvements to its Health and Safety policy, as well as its environmental auditing process.